This lick sounds very similar to when a Neptunian infant is conceived. It begins with an Am arpeggio ascending with a tap on the 24th fret (just like in the movies) and then the same shape is moved back one fret (Abm) and is played descending. Then as if double teamed by probes the 15th on the high E hammers to 18th fret where it is met with an alternating tap also on the 18th fret. This sequence plays 4 quick times and repeats a half step back. 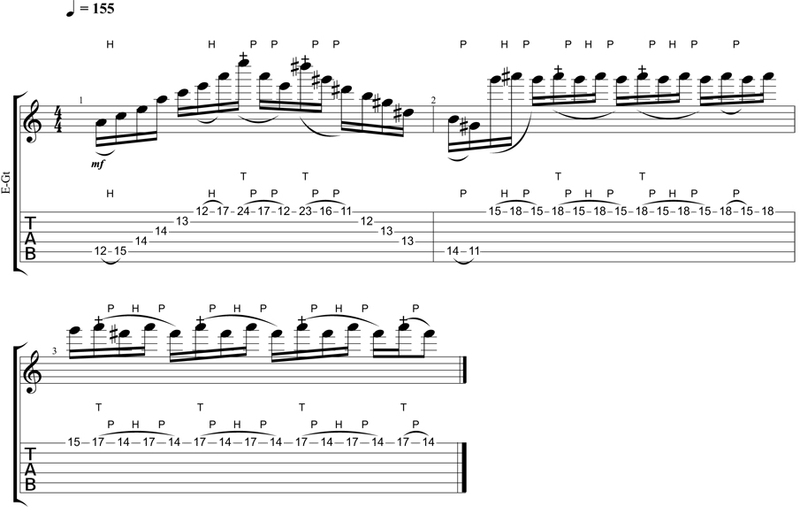 The lick is fairly simple especially if you're used to the arpeggio however tapping the same note as the hammer on repeatedly is an interesting idea to add to your skill set. I've always been a fan of Shawn Lane, Allan Holdsworth, Rusty Cooley, Francesco Fareri, and Buckethead. They introduced to mind portalling intervallic sounds. I enjoy these sounds because it breaks away from the conventional, is limitless and remains new and interesting. I have many licks of this style varying in difficulty, these ideas are great for deathcore, metal, however if used wisely the techniques can be used to ornament different styles. Tom Vautour is a Canadian based guitarist with years of teaching experience and records vocals, instruments and is programs drums for his solo project, Alive And Rotting. Taught from Jazz players in his home of New Brunswick and has had a major influence from the Chops from the Hell guitar instructional collection he has accumulated.